Having grown up in North America, I have seen Halloween, the holiday celebrating people in colorful costumes pretending to be scary and children shaking down their neighbors for candy come to consume a larger and larger mindshare over time. It is not my favorite holiday, but the kids like it (despite not being candy fiends), and my wife views it as a competition. While it was certainly well known in my youth, and children were of course free to roam the streets unsupervised by adults after a certain age (this being the age before helicopter parents), it has become more significant, both commercially and culturally. Moving to Australia, I expected Halloween to not be a big deal. This is not terribly inaccurate. It is spring in Australia, so the idea of Halloween, a fall holiday in North America would be very different. No leaves on the ground, the colour scheme in the trees in vibrant greens and purples, not reds, oranges, and yellows. It is also light longer (this being the southern hemisphere’s spring) so it is a daylight holiday rather than a nighttime one. Commercially, the stores don’t emphasize it much compared with the US, and my neighbours in Alexandria didn’t do much in terms of pumpkins or decorations. 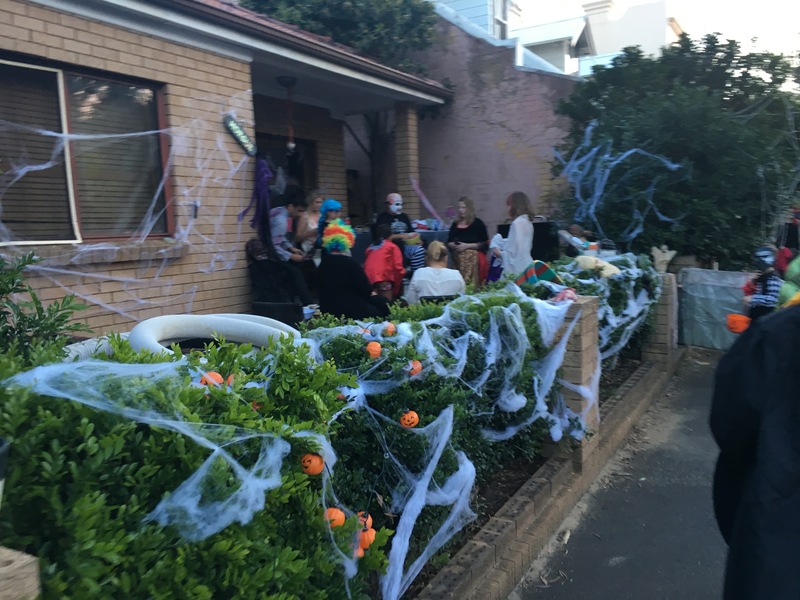 But there is one street in our neighbourhood, Belmont Street, where it takes on a block party like atmosphere, well-organised by a committee, where many houses turn spooky. One imagines a few people were into it, this attracted trick-or-treaters, more people on the block got engaged, and this attracted more kids, while simultaneously depressing turnout on neighbouring streets and thus lolly distribution there. It’s a positive feedback system, like the emergence of hierarchy on roads more generally. This is no Prospect Park by the tower, which has an entirely new interactive stage production annually, and the tradition seems to be people on their terrace home (townhouse) porches handing out candy rather than climbing onto people’s stairs and knocking on doors, with some people doing the convenient thing of leaving a bowl out. It starts early. I saw some pre-schoolers out around 4 pm with parents doing the rounds, Belmont gets going at 6 pm. By 7 pm, the candy was mostly gone.